Loan amount: Business loan rate in HDFC Bank depends upon the loan amount you apply for. Higher the loan amount, lesser will be the interest rate. Bank gives loan of minimum Rs. 50,000 to upto Rs. 50 Lakh. Interest rate for high loan amount can be lower resulting in lower EMIs. CIBIL Score: HDFC Bank offers loan at higher interest rate if your CIBIL score is low or vice versa. However, to get loan from HDFC Bank, your CIBIL score should be atleast 700. Higher the CIBIL Score, higher the chances of getting a loan at lowest business loan interest. Revenue: HDFC Bank will offer you loan at lower interest rate if you have higher monthly revenue. Bank gives loan to the borrowers whose annual turnover is at least Rs. 1 Cr. Time in Business: HDFC Bank offers loan at lower rates if you have significant business experience. Minimum business existence to get loan from HDFC Bank is 36 months. Age: Age plays an important role to know your eligibility and repayment capacity. HDFC Bank offers loan to those who are at least 21 years old at the time of loan approval and maximum 65 years at the time of loan maturity. Loan Amount: Based on the loan amount eligibility, bank gives you loan ranging from Rs. 50,000 to Rs. 50 Lakh. To improve chances of approval, apply for a loan amount that you can comfortably service. Profitability and Revenue: Loan eligibility significantly depends upon profitability on your turnover, revenue and profitability. HDFC Bank requires profit for minimum 2 years and minimum business turnover of Rs. 1 Cr. Business Stability: Future business prospects and its stability is important to improve your eligibility for business loan. HDFC Bank requires minimum business track record of 36 months. The bank will also look for minimum growth in sales for the last three year. A decline in sales for a certain period or below a certain limit might impact your eligibility to get loan. ITR and Banking: Bank gives loan only after checking your income tax return and bank statements. Your ITR details for minimum 24 months and bank statement for minimum 6 months will be required by HDFC Bank. CIBIL Score: When checking loan eligibility, HDFC Bank will look at the complete CIBIL report. HDFC Bank will check your repayment history for all current and past loans and credit cards. Bank advise you to maintain a score of 750 and above to get loan approval. Interest Rate: Higher the interest rate, higher will be the EMI. For a 48 months loan from HDFC Bank at an interest rate of 15.65% per annum, EMI will be Rs. 2,816 per Rs. one lakh loan amount. At an interest rate of 18.30% for the same loan, the EMI will be Rs. 2,953 . Loan tenure: Longer the loan tenure, lesser your smonthly EMI. At interest rate of 15.65% per annum, the EMI on HDFC Bank business loan would range from Rs. 9,057 to Rs. 2,816 for loan tenure ranging from 12 to 48 months. Amount Borrowed: HDFC Bank Loan EMI will be high if you apply for a high loan amount. For amount borrowed Rs. 50,000 , the EMI at 15.65% for 48 months would be Rs. 1,408 . Similarly for amount borrowed Rs. 50 Lakh, the EMI at 15.65% for 48 months would be Rs. 1.41 Lakh. Doctors can take this loan to expand business, home renovation and child's education. This loan is for professionals to expand business, home renovation and child's education. This is a collateral free overdraft scheme to meet your business related needs. 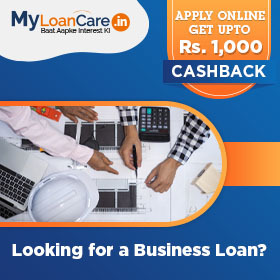 Why to take business loan from HDFC Bank ? Bank offers loan at 15.65% rate with the lowest EMI of Rs. 2,816 per lakh. If you are paying EMI more than this then you can opt for balance transfer and relocate your loan to HDFC Bank. What is the interest charged on HDFC Bank business loan? Interest rates on Business loan in HDFC Bank are very attractive starting from 15.65% to 18.30%. Bank offer various offer for self employed professionals to get loan at very low rate of interest. What is the lowest EMI per lakh on business loan from HDFC Bank ? If you apply for loan from HDFC Bank, your lowest EMI per lakh will be Rs. 2,816 . What is the minimum and maximum tenure of business loan in HDFC Bank? How much business loan amount I can borrow from HDFC Bank? HDFC Bank offers you loan if you need a minimum amount of Rs. 50,000 to a maximum amount of 50 Lakh. What is the processing fee charged by HDFC Bank on business loan? HDFC Bank charges a processing fee of Starting from 0.99%, Max 2.50% with applicable tax. Is age an eligibility factor to get loan for business from HDFC Bank ? Yes, age is an important eligibility factor to get loan as you should be at least 21 years old at loan approval time and 65 years old at loan maturity time. What are the prepayment charges on business loan from HDFC Bank? Bank charges a fee in case you want to repay your entire loan amount before the end of tenure period. The fee charged by HDFC Bank is 2 - 4% . Private sector lender, HDFC Bank has relaunched the upgraded version of its mobile banking application (app), which was pulled down weeks after its launch in November. Now, the app users can install the new version of the app, which is available on both Google Play Store and Apple App Store. In addition to this, the bank also has plans to achieve a significant growth across its retail loans portfolio including home loans and business loans. HDFC Bank is ramping up its lending to small companies that would help it boost profitability. The lender has managed to disburse MSME loans of up to Rs. 1,200 crore till the date. The bank has made it easier for the small scale borrowers to avail these loans in an easier way by granting final approval in only just three to five hours. The bank has entered into the small business lending, with the launch of an analytics-based credit appraisal tool that will help sanction working capital in less than one hour. With the launch of this new product, the lender is targeting to disburse 50% of retail loans including personal loans, digital loans for small business in the coming months. HDFC Bank has announced the launch of Digital Innovation Summit in Gujarat. The summit was held to help the potential start-ups to showcase their unique ideas and innovations that could be employed in the banking sector to aid its growth in terms of business, customers and profit. HDFC Bank has launched its next-generation mobile banking app that enables users to have effortless access to their bank account. This app is effortless and intuitive which allows customers to bank the way that they live. It eliminates all financial and technical jargon for users by grouping transaction into three easy categories- Pay, Save, Invest.